Siesta Enclave is an infill development at the prime residential district known in the local realty trade as “West of the Trail” prized for its superb communities between Sarasota Bay and the Tamiami Trail. 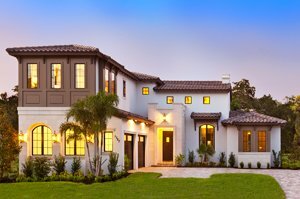 Though small, Siesta Enclave stamped its class in the 2018 Sarasota‒Manatee Parade of Homes with its entry, the Walara. A two-story home with a floor area of 3,464 square feet, this design copped the best overall award in its category in the annual local builders’ showcase. This design is priced from the $800s and features three bedrooms and four baths. The Walara’s architecture presents a contemporary take on the Spanish-Colonial Revival style. Hallmarks to this design are refined and comfortable indoor spaces that transition smoothly to outdoor entertaining areas. In topping its category in the 2018 local builders’ showcase, the Walara was adjudged best in architectural detail, floor plan, master suite and kitchen. 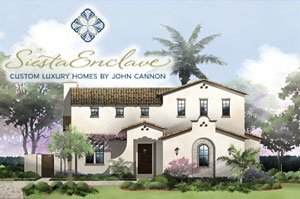 Prospective buyers of homes for sale at Siesta Enclave can likewise choose from a wide selection of John Cannon designs crafted over this builder’s over 30 years of industry experience. This developer’s architectural renditions include such styles as coastal, contemporary, Spanish Caribbean, Mediterranean, West Indies and Tuscan. John Cannon, his team and partners have built over 1,380 custom homes in various communities across southwest Florida. This builder’s masterpieces could be found not only in prestigious gated luxury-home neighborhoods but also in high-end waterfront subdivisions and golf communities. Owing to the consistent superb quality of John Cannon-built residences, this builder has received the annual Sarasota Herald-Tribune Readers’ Choice award in the Residential category more than 25 times. Custom homes by John Cannon win patronage with his outfit’s sharp expertise to fuse a client’s personal lifestyle with their inspired designs. Such fusion is achieved through this builder’s close consultation with buyers. Through this exercise, clients can create a home plan suited to their wants and needs or adopt one of John Cannon’s award-winning designs, like Siesta Enclave’s Walara, and have it modified to their preferences. The superior portfolio of John Cannon’s Siesta Enclave homes for sale is complemented by the neighborhood’ exceptional West of the Trail location. This property’s Siesta Drive frontage shortly extends to the amazing island and beach attractions of Siesta Key, as well as the water-based pleasures of the Intracoastal Waterway. As convenient, Osprey Avenue and the Tamiami Trail facilitate easy northward trips to the Sarasota downtown area and its retail outlets and cultural points of interest. Varied shopping and dining venues are plentiful too at this West of the Trail locality, with some choices already easily accessible in the Hillview area. Another notable local landmark is the Sarasota Memorial Hospital which for years has contributed significantly to the delight of living in this part of the city. Below are the current real estate listings available at Siesta Enclave.